Buying or selling has been a headache to many people; more to those who know nothing about cars. This is not supposed to be the case. The state of Wisconsin has a wide range of sources and documents with informative information on how to complete a sale or purchase. As much as you may want to enjoy the benefits of a newly purchased vehicle, it is important to remember that safety and reliability should be your first priority. Don’t concentrate more on the price; instead look into the safety and reliability of the vehicle you are purchasing. There are several cars in Wisconsin that are safe and reliable; unfortunately, there are also thousands of them that can compromise your safety and reliability. You will not like purchasing a vehicle that will get you stalled in late January when winter is in the pick; it can be deadly. If you are buying a vehicle from a private seller, it is important for you to order a vehicle history report for that vehicle before purchase. The first, before purchasing a car, remember to do your business with a reputable dealer. Working with a licensed and reputed dealer will give you peace of mind knowing that you will not fall victim of a bad deal. If you are purchasing a used vehicle, have the vehicle inspected by a qualified mechanic. If you are purchasing in installments, be sure that you can afford the monthly installments. If you are purchasing a used car from a dealer, request the name and address of the previous owner. Also, make sure the VIN on the vehicle you are purchasing matches the one on the title and insist on agreement contact made in writing. These are two different procedures that can be done simultaneous or at different times. However, these two procedures must be done immediately after vehicle purchase. 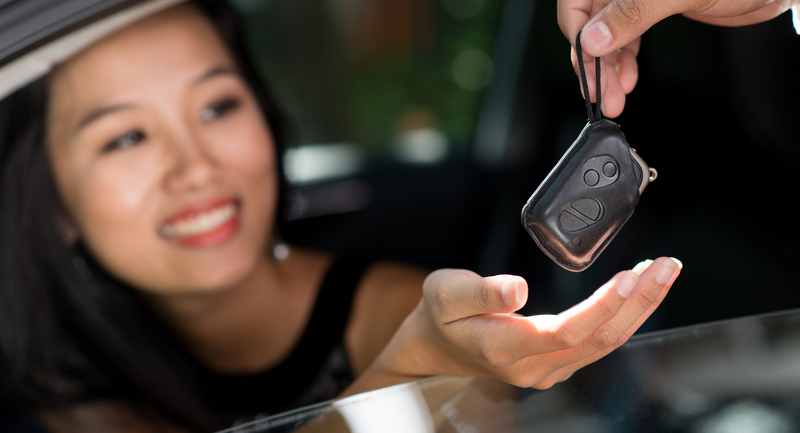 The title transfer or application is the change of vehicle ownership from the previous owner to the new owner. Vehicle registration is the purchase of license plates. You should obtain title paperwork from the seller during the time of purchase. Make sure it is signed and filled out completely with correct information. You should also obtain the bill of sale from the seller. This document should also be filled with the pertinent information. Be sure that all liens in the title have been released. If you are purchasing a vehicle that is 10 years old or newer, the seller should also include odometer reading on the back of the title or on a separate document. Vehicle emission testing is required for all vehicles that are more than 5 years old. It is the responsibility of the seller to provide the buyer with testing papers within 45 days of sale. If the vehicle already passed the emission testing within 180 days before the sale, the certificate will not be required. If you are purchasing the vehicle from a private party, you will need to take the paperwork for registration and titling to the DMV. If you purchase a vehicle from the dealership, the dealer will handle the paperwork on your behalf. Most vehicle registration renewals can be done by mail or online. Released lien signed by the loan company. Once you have submitted all the paperwork to the DMV and paid all the necessary fees, you will be issued with temporary license plates that you can use to legally drive your vehicle in Wisconsin until the regular license plates are processed. If registration period is lapsing, you will receive a notice from Wisconsin DMV by mail requesting you to renew your registration. When selling or buying a vehicle, the title must exchange hands. If you are a buyer, don’t purchase a vehicle without a title. If the title is missing, ask the seller to apply for a duplicate copy with the DMV and sign it over to you. To do so, the seller needs to fill and submit Replacement Title Application (Form MV2119) and $20 fee to the DMV office. This can be done through mail. The seller can also request a replacement title online. Following these two methods; the duplicate title will be issued after 10 days. The seller can also request a lost title in person by submitting above forms and a $5 service fee. In this case, a duplicate title will be issued on the same day. A vehicle does not have to be registered to be sold. As a buyer, you will need to obtain temporary license from the DMV within two days of purchasing your car. Temporary plates cost $3.